Before you can participate in a class, you must have had a conversation with the teacher (either by phone or in person) and have paid the appropriate membership fee (see below). You are welcome to come and watch a class – please see details of class times below. Please use the entrance to The Island in Bridewell Street, and follow the signs for Ki Aikido. Please ensure you use the Bridewell Street entrance only – the dojo (practice space) is not accessible from other entrances. The centre of Bristol is busy on a Friday evening, and motor access to some roads is restricted. CYCLE Parking: Bikes cannot be bought in to The Island building. Do ensure your cycle is properly locked. Before anyone is allowed to practice, he or she must be a member of the Ki Federation of Great Britain (KFGB). Joining the Ki Federation involves an annual payment. This means that we must take cash or a cheque for your first month before you can take part in a class. Standing Order: after the first month (which has to be paid cash or cheque), payment is by monthly standing order. Fees: For one calendar month’s practices – four or five classes, each lasting two hours. When members begin to practise they may wear any loose, comfortable clothing and wear sandals or flip-flops between the changing rooms and the mat. Toe and fingernails should be short and clean to prevent any injury and jewellery should be removed. There are changing facilities at The Island, so please bring your clothes for the class with you. Eventually however a white Kidogi (aikido kit similar to that used for judo) should be worn by men; and a white Kidogi and black hakama by women. The club welcomes new members. 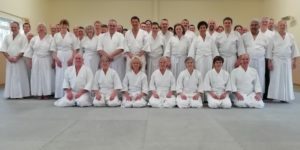 A good first step is to come and watch a class to see Ki Aikido and how it is taught. The class meets weekly on Sunday evenings between 7.00pm and 9.00pm. There is a short break for tea at 8.00pm. Please ensure you arrive early – for 6:45pm. The teacher or one of the more experienced students can then introduce you to what you are about to see. Please make enough time to watch the lesson until the tea break. During the break we are happy to answer questions about the practice and the club in general.